The musical Internet shop iTunes Store has informed on February, 24th on downloading of a ten-milliard song and has published the list of 20 most popular tracks. The 1st place is awarded to track Black Eyed Peas "I Gotta Feeling", the 2nd — Lady Gaga "Poker Face", and the 3rd — again Black Eyed Peas with a composition "Boom Boom Pow". 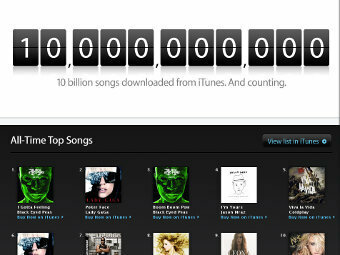 In July, 2009 corporation Apple has informed, that in iTunes is downloaded 8 billion tracks. Thus, two more billions songs it has been bought all for seven months. For comparison to reach first billion downloadings, it was required to shop almost three years. Musical service iTunes Store has opened in the spring of 2003. Now in the catalogue totals over 10 million compositions, more than 3,000 teleshow.